JSI staff have extensive experience working at the multi-state, state, local, and institutional-levels to develop emergency preparedness and response plans and continuity-of-operations plans. JSI uses a participatory approach to plan development and strengthening, drawing on the expertise and experience of multiple stakeholders to forge effective plans that reflect context and vulnerability planning guidance and promising practices. 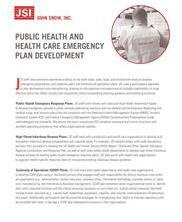 This pamphlet provides further explanations on Public Health Emergency Response Plans, High-Threat Infectious Disease Plans and Continuity of Operations (COOP) Plans. JSI, 2018.